in 2012, where I decided to show some "for real" pictures. 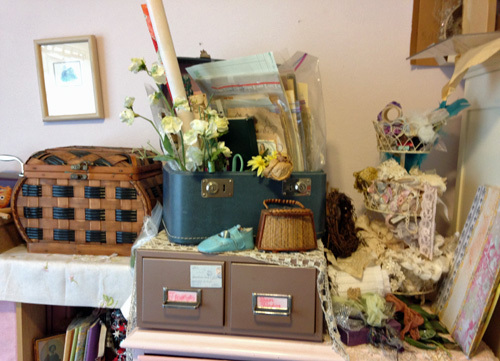 I've played with various arts and crafts over the years: jewelry making, psanky, painting bird houses, etc and so forth. 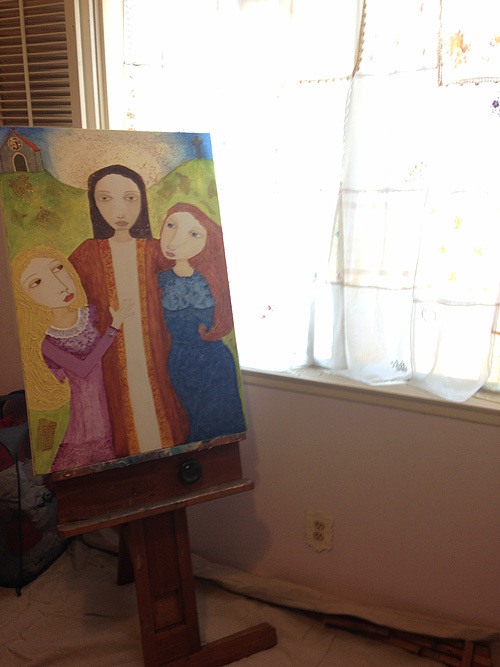 And I've settled down to three: art journaling, icon writing, and I'm currently exploring painting large canvas. I discovered that I didn't have enough space on my desk to art journal (the current one is on the large side) and write an icon. I could set aside an icon in progress for 8 months before getting back to it because it meant clearing a lot of space off my desk to switch from one to the other. 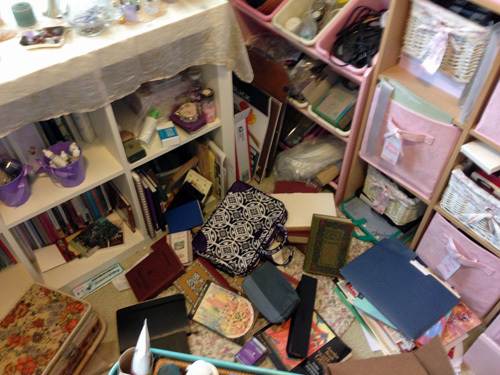 And let's face it, I'd let my room get out of control. Ready for the before pics? 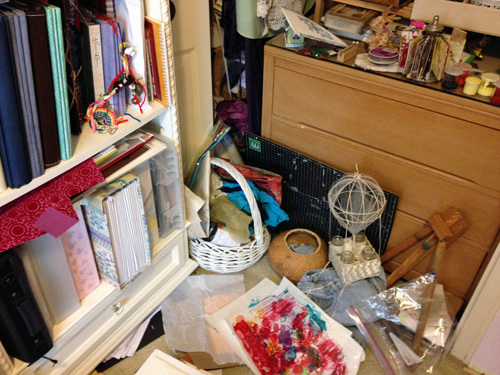 I spent a few weeks planning, adding to my Pinterest board, following the 52 Weeks Workspace Challenge, drawing up maps to rearrange things so I'd have room to really paint without falling over something, or getting paint where it shouldn't. I spent $55 at Michaels buying some new storage items (only that much thanks to a 40% off coupon!) and I still need to buy a couple of hooks to hang up my apron and something else. 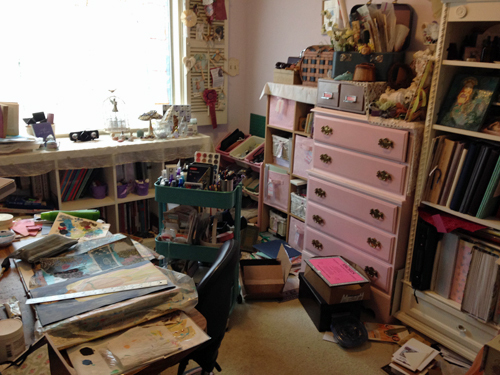 I spent the whole Memorial Day three-day weekend, moving everything in those cubes out of this room and then back in again, sorting paper (honestly, there is no reason for me to buy paper ever again unless it is Arches watercolor paper), rearranging and moving out furniture too. 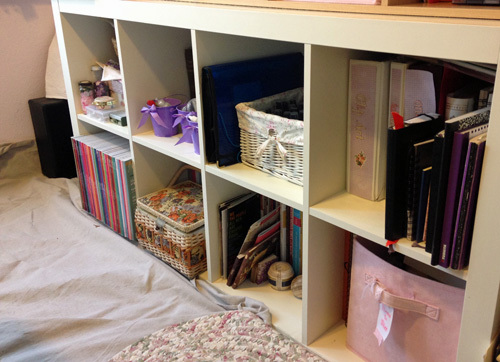 I stacked the cube shelves (one IKEA, one Target) and removed the pink dresser and the kids storage cubby that had been tucked into the corner. 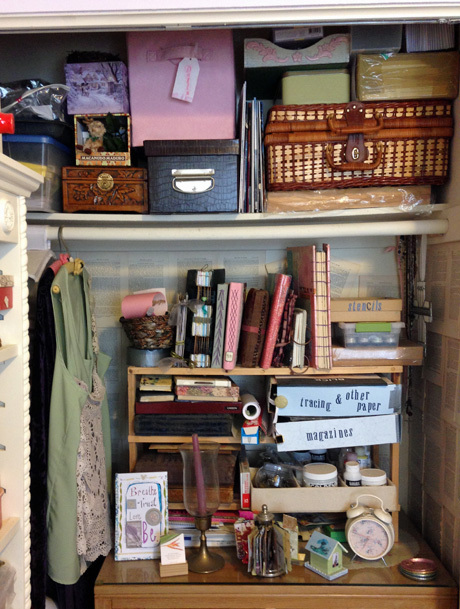 I didn't put my jewelry making supplies or psanky tools into the donate pile but rehoused them in a plastic container to store (top left). When I retire, I'll get back to those. Probably. 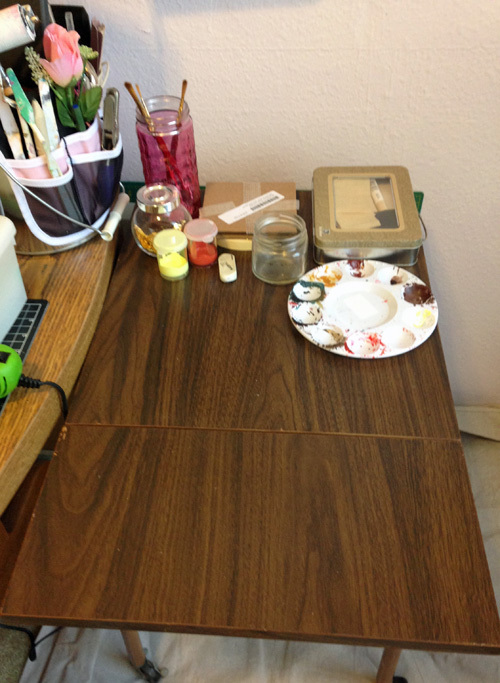 Here's the desk. Not quite as pristine as it was before I started working in the big art journal again but close. It's weird but the OttLite lamp is creating more glare from this angle/proximity than its original placement. I may have to move it slightly. I kept only my most frequently used supplies here, the others are in one of the cubes. 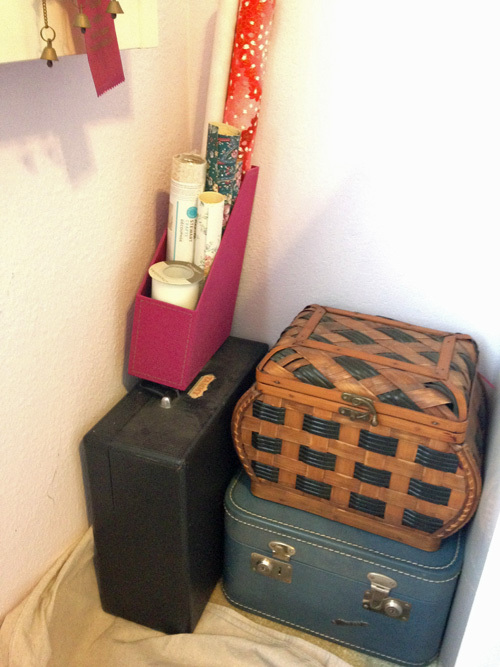 This was one of my new purchases, a Recollections pen/markers storage. I put it together myself (and missed the bit about adding dowels for greater stability but I feel pretty confident that I'm not going to overload this thing.) This is better than having the pens stashed in several different cases in my teal Raskog cart (which just needed a tidy). The black box on top is my set of Faber-Castell markers. 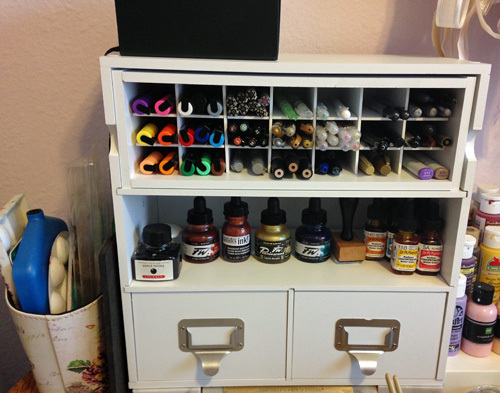 The drawers hold Promarkers and Aquamarkers. And yes, I own only two Copics. I do not love the alcohol markers. I wrapped a box in fabric and lined the inside of a plastic container (top right), and you can find how I did those two things on the Pinterest board I linked to above. Continuing to move right to left: mediums, large bottles of paint and a purple pottery vase that doesn't really belong there but I unearthed it during my clean out; Paper scraps sorted by color and/or type and/or size into cigar boxes and other small containers; small journals completed and an old tintype. The next row, coming back left to right: the mythical "Current Project". I will get to it. I will!! ; a White Pages that I use when I'm punching holes in signatures to make new journals, canvas and other odd mixed media tools; a "Future Projects" bin; box of stamps with pastel sets underneath. You can't really see so great at this angle but from left to right: flowers and art case for traveling (it's a large make up case); old books are behind the purple pots which contain glitter Stickles, Flower Soft, and fabric paints; the blue folder holds all my large stencils, which is better than having them out and flat, I hope, and a bin containing all my glimmer mists plus a few more glues and paints; clip art, lessons and journals. 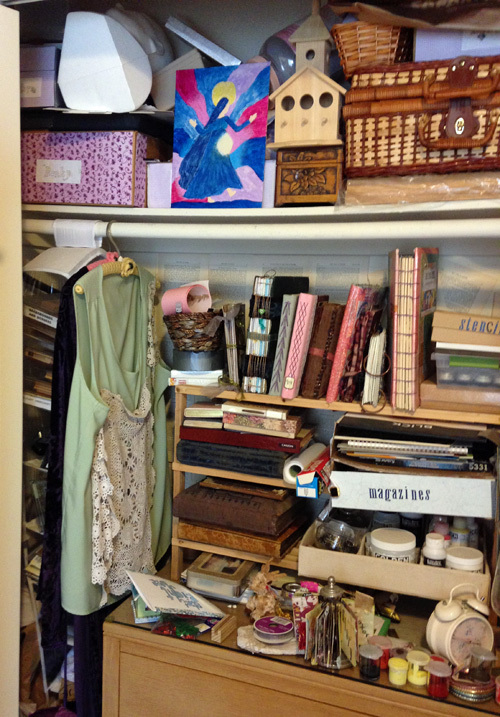 On the bottom row, right to left: Somerset Studio magazines, stacked two deep; sewing box in front of more Somerset magazines (Art Journaling and some others, I stopped subscribing); art books; larger journals and a bin of items to alter. 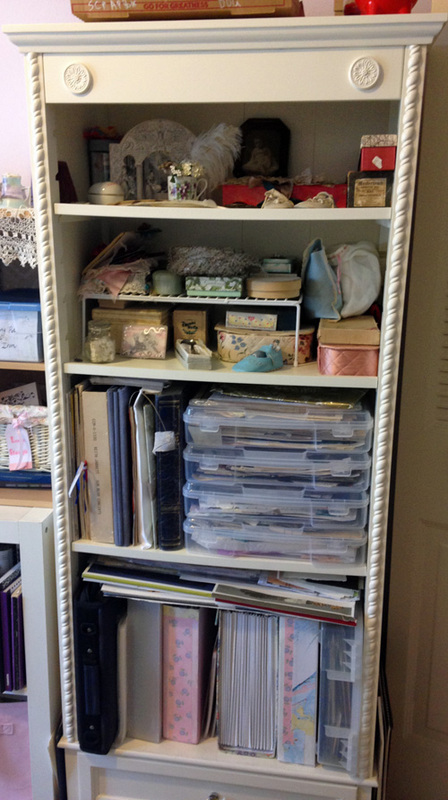 I moved the completed scrapbooks out of here and into the formal living room so I would have room for these four Iris cases which contain book paper, tissue paper, sorted color papers. 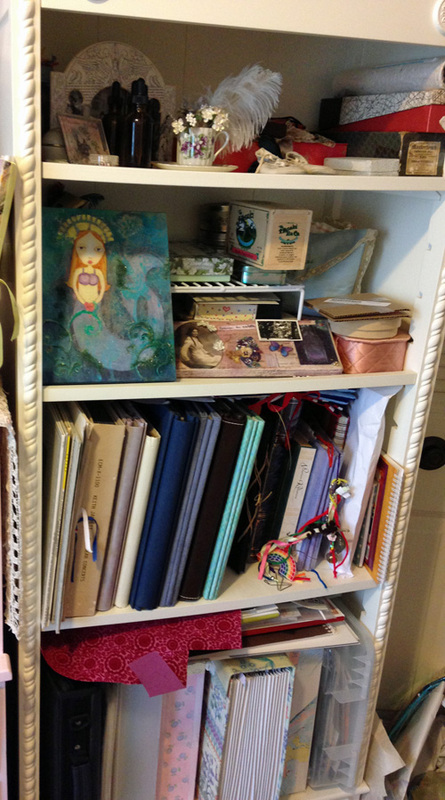 The stuff lying flat across the bottom shelf are fodder for larger art journals. 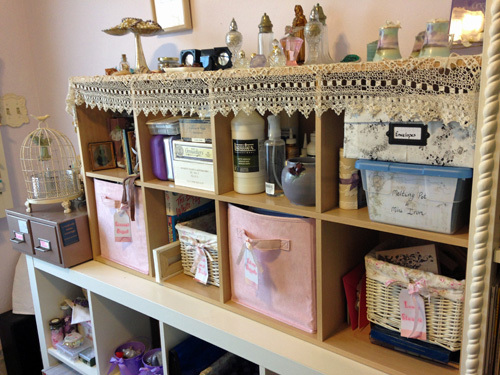 It feels a little insecure here but this file cabinet contains flowers (pretty light) and seam binding and lace, with more lace bitses behind. More lace in the blue suitcase (yes I do have a problem) which I initially used for a Silver Bella trip to store all my travel supplies, a typewriter and the woven box contains unsorted ribbon. 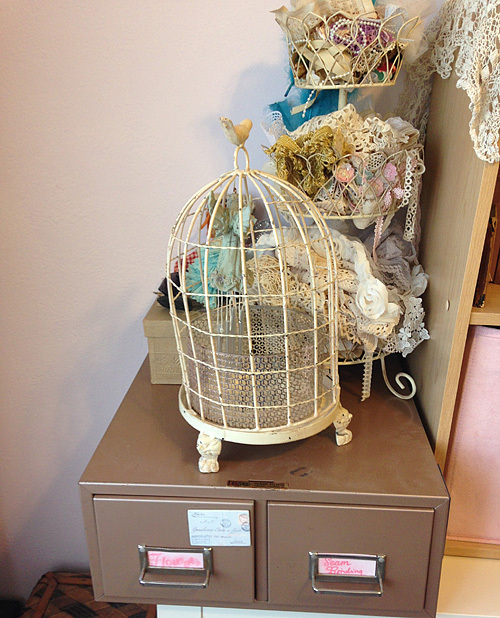 Wallpaper, wrapping paper and tulle are in a magazine holder. And space to play with painting on large canvas. 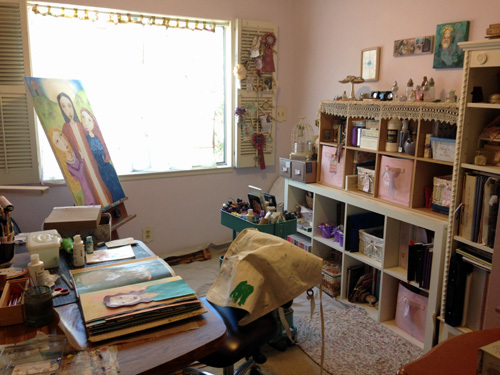 I haven't really tried painting in this new position yet, but I am thinking that I may bring in a tiny bedside table that's out in the garage (also pink) to use as a place to put brushes and palette. 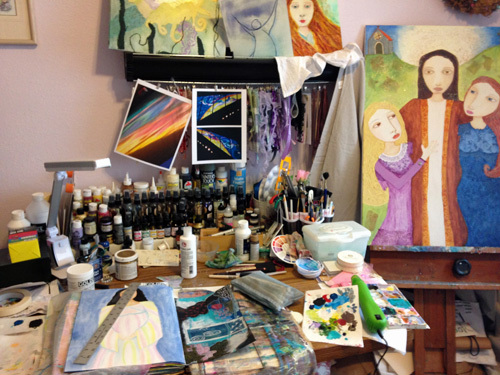 And that's my new art studio! If you have questions about anything, ask away in the comments. Hi Leanne thanks for checking in so we could visit your here! 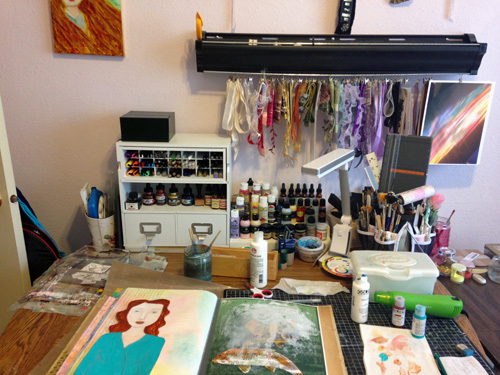 I can see how happy you are creating in your studio with all the art inks, paints etc. you have displayed around you! Thanks Suzy! I've been having fun exploring! 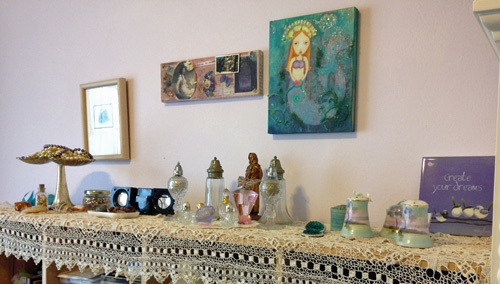 I love the bohemian and vintage flair in your space. You are a true artist. Love your style. Thanks for sharing your space with us.